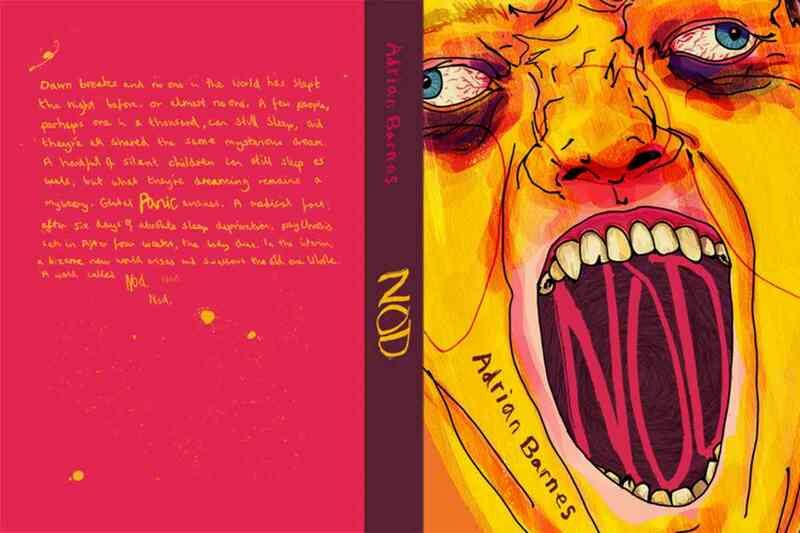 Nod by Adrian Barnes was first published in 2012 and was shortlisted for the Arthur C. Clarke Award in 2013. Titan Books have now reissued it with a beautifully striking, not to mention extremely creepy, cover. Nod is an end-of-days, quasi-zombie thriller, with literary pretensions. It’s deeply unsettling and not for the faint of heart. Set in Vancouver, British Columbia, it charts the world’s descent into madness after most of the planet’s population stops being able to sleep. Nod is apocalypse by sleep-deprivation. A feeling most readers of GeekDad will identify with (he says, trying to remember the last time he had a full night’s sleep). Like many dystopian visions of societal breakdown, whilst most of the planet is affected by the novel’s overreaching plot device, a handful are not. This sets up a “Them vs Us” dynamic, with the “Sleepers” being heavily outnumbered. Main character, and narrator, Paul is a Sleeper and we are reading his account of the last days of society. Things start gently enough. After the first night, the lack of sleep is merely a curiosity, but after night two, panic and dread flood in. In a matter of days the veil of civility that keeps society functioning is torn away, with predictable consequences. Nod‘s narrator, Paul, is a writer. He’s also a misanthrope, giving his story a bleak tone, even before the world unravels. As the novel opens Paul is working on a project called ‘Nod’; a treatise on lost words. Later, Paul’s manuscript falls into the hands of a charismatic, borderline psychopath. In his hands, The Land of Nod, a place of sleep, takes on mythical proportions. Barnes prose style is spare, almost brittle. There is a palpable sense of edginess brought on by lack of sleep. His writing conveys the feeling of needing some peace and quiet, but instead having to deal with a querulous world (toddler). Being about to snap, but holding it together, despite that desperate ache behind the eyes. It could almost be parenting 101. Nod is steeped in geek culture, with many references to seminal works; superheroes and magic rings. The formation of a cult, led by the ‘Admiral of the Blue’, and the misappropriation of Paul’s writings as a religious text, offers food for thought on the rise of cults and the nature of religion. It examines the need for humans to belong, and their willingness to be led, unthinking. To do any number of unspeakable things in the name of collectiveness and belonging. I read a lot of dystopian fiction, and have often thought, that for a father of three, it’s a pretty depressing thing to be into. I’ve consumed countless bleak, destructive, visions of my children’s future. Nod is one the grimmest proffered. “What happens to the children?” is often a question left quietly unexplored in these types of books (unless they’re YA novels, but then the answer is usually, “Tool up and overthrow our oppressive masters”). Barnes is unflinching in letting us know how bad it will be for the children. Bad enough for the children who don’t sleep, but far worse for the Sleepers. As a parent, this is heart-rending. Not as painful as Cormac McCarthy’s The Road, but certainly the most devastating thing I’ve read since. There is something compelling about reading about the destruction of the planet. Considering the volume of dystopian visions offered, in over a century of writing, it’s not a new trend. Tales of our end of days have long been popular, perhaps because they often rail against the prevailing political and social climate of the time. Perhaps I like them because of the slightly self-satisfied feeling I get knowing I would never behave in such a morally dubious fashion (moral certitude is always simple from a warm comfortable armchair). I sincerely hope that the visions outlined in dystopian fiction are overly bleak. I hope that humanity would rise above the evils dystopian authors have them commit, but there is a voyeuristic, visceral thrill, in suspecting that it probably wouldn’t. In truth Nod is not a dystopian vision but an apocalyptic one. Barnes’ vision of humanity shuffling about as sleep-deprived zombies is horrific. Some characters rise above the need for self-preservation, but with the sleep deprived only given a few weeks to survive, societal breakdown is inevitable. Barnes’ chronicle of its descent is simple and unsettling. If you like this type of fiction, then you will greatly appreciate this deft addition to the canon. This new Titan edition also carries a copy of Barnes’ essay My Cancer is as Strange as Fiction. A brief and moving account of his diagnosis of brain cancer, and the similarities, between Paul’s fictional decline, and the author’s own, very real one. Barnes’ diagnosis came after Nod was completed, but the parallels are remarkable. The essay makes a sobering end-piece, for a sobering novel. Unofficial cover inspired by the novel, created by UK artist Abi Stevens (abistevens.squarespace.com). Image used with permission. Hello! Today is my turn for the All Their Minds in Tandem blog tour. My contribution is a short review of this unusual and thought provoking book. Memory. Loss. Redemption. Three words that govern David Sanger’s debut novel, All Their Minds in Tandem. The book is a peculiar blend of western and supernatural thriller. A pairing you might think ought not to work, and to be honest, it probably shouldn’t, yet Sanger makes it so. I struggled a little at first. It reminded me of novels of similar setting and ambition, Son by Philipp Meyer and The Sisters Brothers by Patrick DeWitt. Both of these books were highly feted by critics, but didn’t particularly win me over. They had much to admire, but didn’t convince me as a storytelling whole. All Their Minds in Tandem however held my attention, right up to its gripping finale. 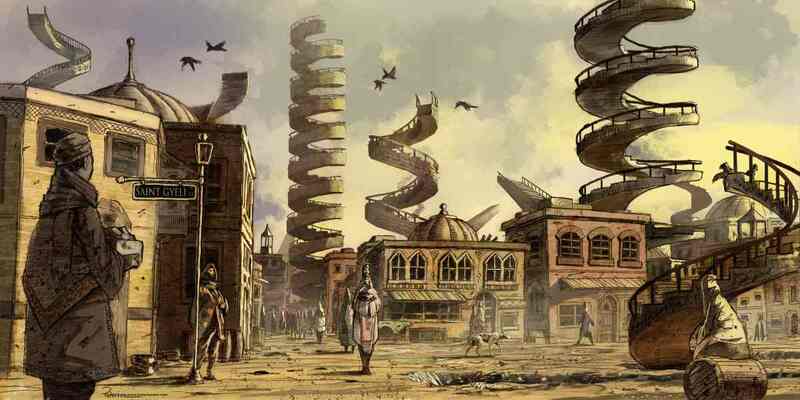 It has an interesting setting; a lawless frontier town, not long after the American Civil War. More appealing though is the theme of memory that runs through the novel’s. 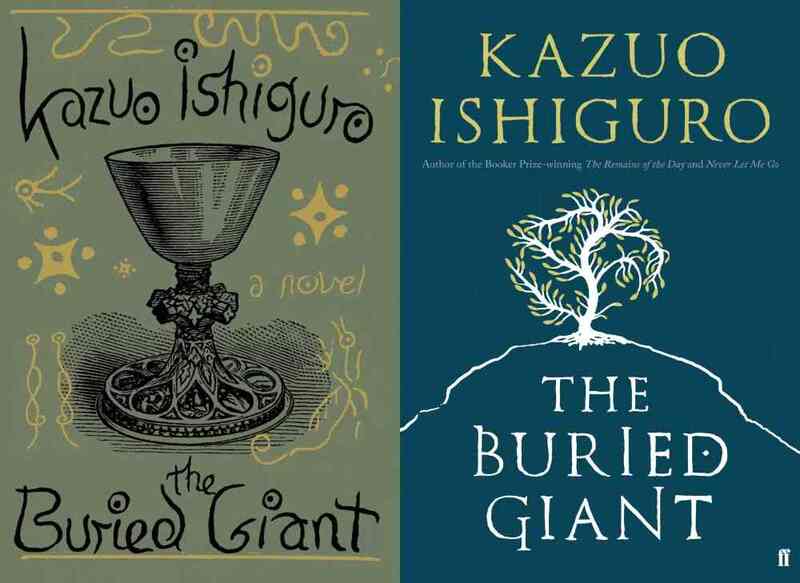 It dovetails perfectly with another of my recent reads, The Buried Giant by Kazuo Ishiguro. Both books examine the nature of memory and to what extent it encapsulates our humanity. Without our memories, what are we? To have no memory is considered a curse, but would humankind be better off, if it couldn’t recall the slights done to it? The book centres around Emerson, a travelling something; A ‘storyteller’ by his own description. Emerson claims to be able to give you new memories, for a fee of course. His arrival in New Georgetown barely makes a splash, yet the effects of his arrival ripple through the small town like a tsunami. There’s the peculiar doctor to whom he is administering his special treatment, and the three sisters who own the house in which he rents a room. Each of them see Emerson as something different. There’s the young lad who loves to play the piano, and his sister, a barmaid. Finally, there’s the mysterious ‘Bird’ who entertains drinkers in the bar with wondrous music, yet nobody has ever seen the person behind the voice. Emerson’s arrival will effect each of them in different ways, but is he a truth-teller or a charlatan, a blessing or a curse? They all have memories, they all have secrets. Does Emerson know them? Can he take them? Did he put them there in the first place? And why is he uncannily familiar? Such is the peculiar sense of dread that pervades the novel and Emerson’s quiet residence in the town, it starts to feel like it was written by Stephen King. The creeping edge of menace is what give All Their Minds in Tandem its extra dimension. From about half-way through the book a sense of something ‘other’ starts to pervade and it kept me reading. The front we show the world are stories we project. Stories that show the world the way we want to be seen. We might each have several stories for different aspects of our lives, but almost nobody but us alone, knows the entire truth. With Emerson and his ability to rewrite personal narratives, David Sanger examines this premise and weaves it into a spellbinding story of memory, loss and above all, redemption. I was sent a copy of the book buy the publisher in order to take part in the All Their Minds In Tandem blog tour. To celebrate the release of Vu Tran’s debut literary thriller, Dragonfish, the fine folks at No Exit Press have come up with a fun way to get the community talking about the book. Everything you need is in the description below. My effort is also included. Time to let your creativity off the leash: write something and share it on Twitter using the hashtag #WhereIsSuzy. Using only the information of the synopsis above, (though Google’s help might be acceptable) please write a blog post in 10 minutes as to where Suzy is. There is no right answer and no need to think about it for more than one minute. Instead, we’re seeking to display the creative possibilities of where a story can go. We’d like to get as many people involved in this as we can in order to provide as many different ideas and outcomes as possible. Suzy ended up in Malaysia after fleeing Saigon, where she had been a good-time girl for American servicemen. The Americans first found her across the Vietnam border in Laos, where she was transporting opium from the Golden Triangle. The Americans, never officially in Laos, found her near the enigmatic ‘Plain of Jars’, but what exactly did she see there? Suzy’s secrets lead back through Laos, into Cambodia and a U.S. Secret Service bungled attempt at halting the rise of the Khmer Rouge. Was it a CIA mistake or did somebody put personal profit before the extermination of thousands of people? A violent husband and his shadowy Vegas connections have forced Suzy to flee back to the town of her birth, to discover the truth of what she was unwitting part of during the Vietnam War. Sonny is only part of the story. The CIA and a millionaire Vegas casino owner want to make sure Suzy never finds the truth and that Robert never finds Suzy. Beyond Sodor: Books About Trains You’ll Actually Want to Read to Your Kids! When I was growing up, I loved the Rev. W. Awdry books, these days better known as Thomas and Friends. Back then the books weren’t a marketing behemoth. There were no television series, no films, and no wooden railway. There were just twenty-six small hardback books, each containing four stories that centered around a single train. I had a mismatch of books, from all sorts of places, some new and some hand-me-downs. I loved them with a passion, carrying them all over, wherever I went. My collection survives today and has found its way into my children’s bedrooms. If you can get a hold of some of the original books then, whilst dated, they contain nicely written stories that hark back to the golden age of steam in the UK. They have a warmth and wit that is lacking in the more modern stories. Particular favorites are book No. 2, the original Thomas the Tank Engine stories, and No. 16, Main Line Engines, featuring the first appearance of the mischievous Bill and Ben, the twin engines. In the intervening years, lots more books and trains have been added. A few of the traditional type–hardback with four stories–but more to the Thomas Story Library, which comprises thin, single-story, softback books. Somebody brought us fifty of these a few years ago but now there are 65. Some of the Story Library books feature the original engines, with the stories largely copied verbatim from the original books, but many of the others are wholly new tales, which are, frankly, terrible. Clearly, it’s been recognized that new book + new train = toy sales, with each train being sold in three major formats (Take and Play, Thomas Wooden Railway, and Trackmaster). Whilst each book might add to HIT Entertainment’s profit margins, it adds little value for us, the parents, who have to read the new stories. 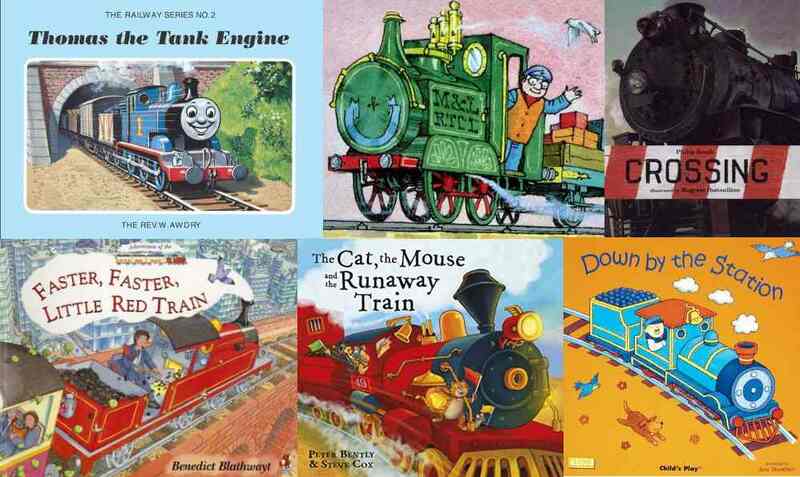 Having to read these stories night after night can make bedtime something of a chore, so if you are currently stuck in the seventh circle of Sodor, here are a few other train-related books that might distract your little ones from Thomaspeak. 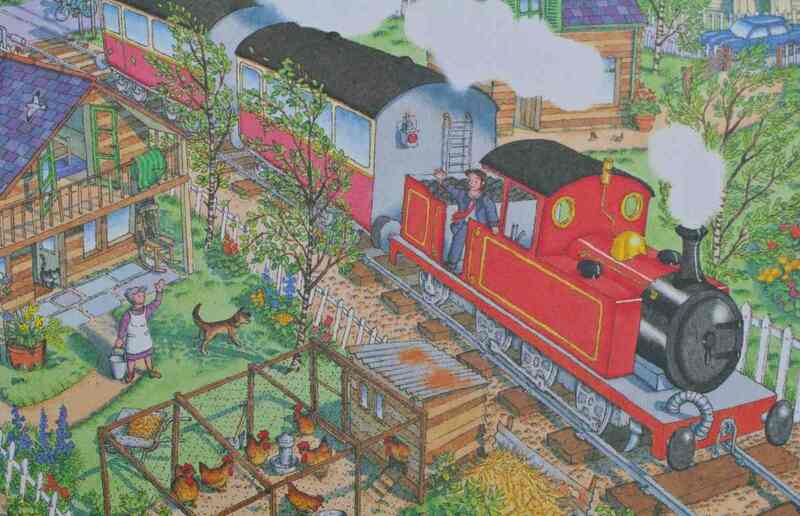 We’ll start with Benedict Blathwayte’s Little Red Train Books. The best thing about these books are the illustrations. The stories are readable, usually about the plucky red steam train and his driver, Duffy, overcoming the odds, but it’s the pictures that will keep children entranced for repeat visits. They’re filled with bucolic, quintessential, English countryside–farmyards, lakes, and crumbling stone castles, but the gems are in the details. The cows have hidden maps in them; sometimes the clouds are shaped like animals, and, in The Runaway Train, children who know the story can spot the troubles ahead in the background of each picture. There are some beautifully illustrated children’s books out there, and The Little Red Train are among the best. Our favorites include the onomatopoeia of Faster, Faster Little Red Train, the Europe-touring Green Light for the Little Red Train, and the sheer excitement of The Runaway Train. Rather simpler is Child’s Play’s rendition of Down by the Station. This is a simple retelling of the popular nursery rhyme, but one that forms part of the publisher’s Classic Books with Holes range. Each page has a hole cut in it that reveals one more vehicle that is “down by the station” causing the station to gradually become more and more cluttered. There is also plenty of toot tooting and beep beeping for little ones to join in with. All the books in the series are great, and Down by the Station has had many repeat reads. Another of my childhood favorites is Ivor the Engine, written by the team who created British television cult classics The Clangers and Bagpuss. 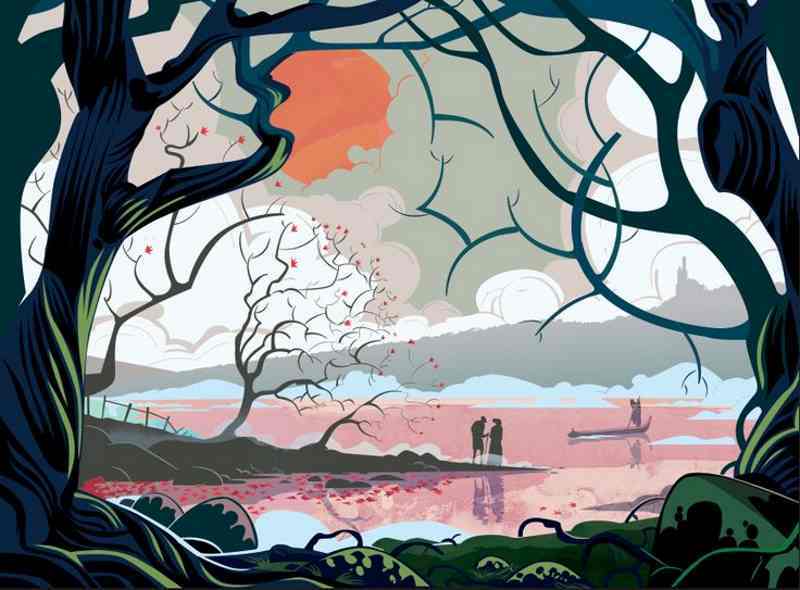 Ivor lives in the “top left-hand corner of Wales” and the narration for the TV series has a wonderful Welsh lilt, which, if you’ve heard it, is impossible not to drop into as you read the books. The writing is wonderfully lyrical–“Jumping cold it was too, that morning, but bright as a pin and Ivor felt glad to be alive and steaming.”–and the stories are great to read aloud. Ivor is the engine of the Merioneth and Lantisilly Railway Traction Company Limited, a beautifully archaic and evocative sounding name. The tales feature Welsh choirs, fish suppers, the incomparable “Jones the Steam,” and mythical, heraldic Welsh dragons. There are six books in all and they’re lovely, though they are now out of print and tricky to get hold of. A more modern train tale, though still with steam is The Cat, the Mouse and the Runaway Train. The title pretty much tells all. With vibrant illustrations, we follow the tale of a cheeky mouse and his nemesis, Carruthers the cat, and an out of control train hurtling towards the station. What follows will change the Stationmaster’s, the cat’s, and the mouse’s lives for ever. After a couple of reads through, it’s easy to pick up the book’s rhythm–just like a train hurtling across the countryside. Reading it becomes very reminiscent of W H Auden’s classic poem The Night Mail. More classic poetry can be found in Crossing, a modern reprint of Philip Booth’s 1957 poem of the same name. A friend brought us this book from a thrift store, and we had little or no expectations of it. Bagram’s Ibatoulline’s idiosyncratic illustrations don’t necessarily give the book immediate appeal and neither do the broken, staccato, and deceptively simple words of the poem. Yet this book has become a firm family favorite. All of my boys have loved it and even now my ten-year-old will sit and listen to the poem’s hypnotic rhythm. Again, it takes a few reads to catch it, but the meter of the poem does match the slow rumble of a huge freight train as it clanks across the crossing in a tiny mid-western town. The illustrations fit the poem perfectly, and they too are deceptively simple. There’s lot’s going on, which we still notice after many, many repeat readings. I’ve often had to read this book ten times straight, and, such is its quality, it has never got tired. So there we are, a journey around the books our somewhat train-obsessed family have enjoyed, but there are many others. Railways, buses, and trams are an endless source of fascination for children, and there are so many good books out there beyond the island of Sodor. Do you have any railway favorites? Which public transport tales have you had to read more times than you’ve had hot dinners? I’d love to read your suggestions in the comments below. Rules for a Knight is lovely to read aloud. The chapters are short and their message clear, but are interesting enough to debate their finer points as you head up the wooden hill to Bedfordshire. The book is nicely presented: a small hardcover with a pleasingly tactile cover, and a bookmark ribbon. It would make a great, slightly different gift to mark a birth, christening, or Jedi knighting ceremony. Rules of A Knight is available from Hutchinson. All royalties from sales of the book are being donated organizations working to help young people overcome learning disabilities. I received a free copy of the book in exchange for an honest review.